I'm working from home today so decided to try a new recipe which I could whip up as quickly as making as sandwich for my lunch I found in a free baking leaflet. 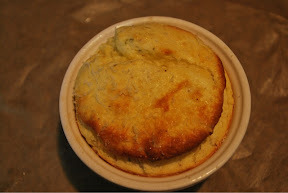 It's a quick and easy, relatively healthy version of a cheese soufflé made with Philadelphia Light. I whisked 1 egg yolk with 100g of Philadelphia Light and added some thyme and 12g of flour and then folded in the egg white (whipped to peaks). 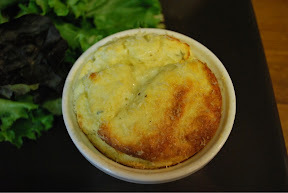 Strangely the recipe had no seasoning mentioned but I added salt and pepper and a grating of parmesan to the top and then put the mixture into two greased ramekins, baked for 25 mins at 160 C and served with a green salad. The mixture raised well and didn't sink when it was removed from the oven but I felt as though it could do with some parmesan stirred through the mixture to improve the flavour. Also the texture wasn't as good as a normal souffle but I seeing as it's so quick to make and pretty low calorie then I can't complain too much!